Earlier this week, Dr. Darryl DelHousaye announced his promotion and transition to Chancellor. We are now excited to announce that our search for the new president of Phoenix Seminary has officially begun. We have partnered with CarterBaldwin in this important task, and they have just posted the Phoenix Seminary Search Profile. If you or someone you know would be interested in the position, please pass this link to the Profile on to them. All applications and nominations will be accepted until the new President is appointed. 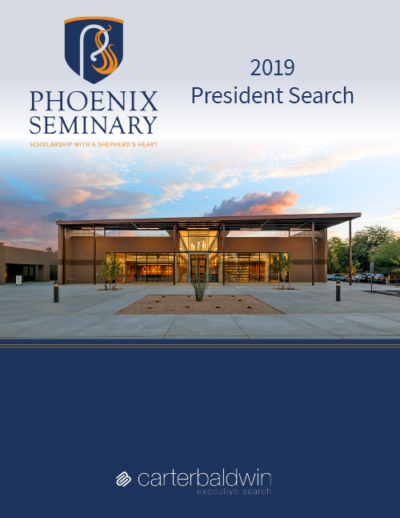 For most favorable consideration, applicants should submit a CV/resume and a letter of interest addressed to the Phoenix Seminary search committee by March 11, 2019. All nominations, expressions of interest, and applications will be handled with complete confidentiality and should be submitted directly to PhoenixSeminary@carterbaldwin.com. We rejoice in the Lord, for he is good, and we rejoice that he has sustained the seminary so that it may undertake its mission of training men and women for ministry to the glory of his name. Please, join us in praying that God would lead us to the right president, who will lead Phoenix Seminary into the future.